A turntable might be seen by some to be an antique, while for the others, it might be a plaything for folks who have some extra dough to splash at the end of each month. After all, vinyl records are not all that cheap in the first place, and they do tend to wear out with constant listening, so you might want to use them sparingly. Well, a device that does CD playback and has USB compatibility is extremely common and affordable, but if you would like to go all out, then the $94,000 Swiss Engineered Quad Calibrated Turntable might be just the right thing for you. This happens to be a turntable that provides vinyl enthusiasts the pleasure of listening to LPs using one of four precisely calibrated tone arms. It has been specially crafted in Bern, Switzerland, where it is composed of a magnetically suspended aluminum platter that is nestled within a special wooden cylinder, ensuring it delivers a stable, silent base that will remain unaffected by environmental vibration. 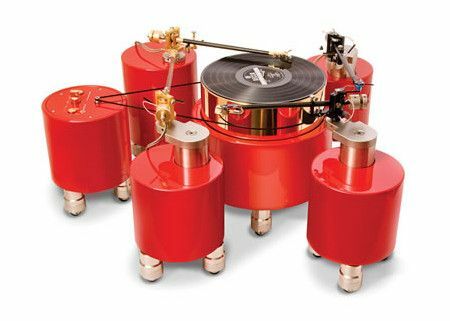 A quartet of smaller cylinders will surround the platter of each house, letting you listen to different styles of music with whichever tonearm provides your preferred sound quality. Not only that, there is also integrated damping technology that does away with the troublesome sonic aberrations generated by common consumer models, as each cylinder sports a trio of adjustable steel feet that enable precisely calibrated height placement for the central platter and four tonearms. Definitely a purchase for the filthy rich!